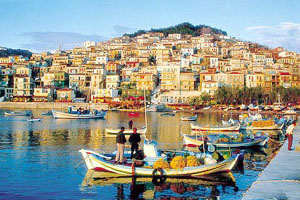 Lesvos: The Greek island which is different from the others. Lesvos (or Lesbos), or Mytiline as commonly referred to by the Greeks after the capital of the island, is the third biggest of all the Greek Islands. 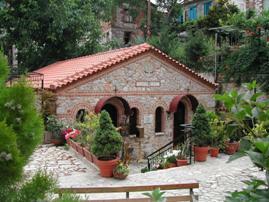 It is situated in the North Eastern Aegean Sea, adjacent to the coast of Asia Minor. The island shape resembles a plane leaf and it measures 70 km in length and 45 km in width. It is populated by app. 110.000 people. 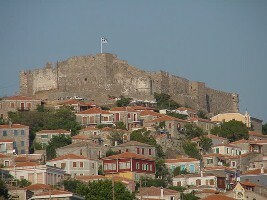 The land of Lesvos (1698 sq. km) is the result of volcanic eruptions; hence its mountainous and stony morphology with an abundance of mineral water springs. The landscape presents sharp contrasts to the eye and keeps every visitor stimulated and enchanted. 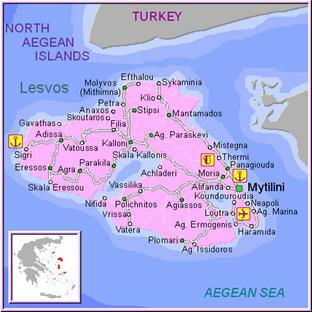 The natural simplicity of the coastlines, the clarity of the sea, the mountainous magnificence of mountain Lepetymnos in the North, the abundantly wooded slopes of Agiasos built at the base of mountain Olympus in the South, and the moon like appearance of the geologically disturbed south western area around Sigri, with the unique Petrified Forest, all contribute to the attractiveness of the island. Vast olive groves ( 11 million olive trees ) , dense pine forests, sandy beaches, churches and monasteries, castles, ancient sites, traditional houses, cobbled streets, friendly and welcoming natives, local traditions and customs paint a picture which is unforgettable for every visitor, every time. 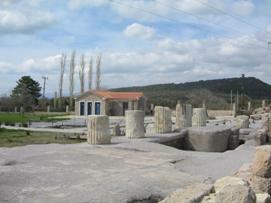 The island is also recognised as a cultural excellence centre from ancient to modern times. It is the home of Sappho the poetess, Arion the sitar player, Terpandros the musician of the ancient times, and home to Odysseus Elytis the poet, Stratis Myrivilis the author, Theofilos the na�ve painter and many more people of the arts of the modern times. It continues the long tradition of producing excellence in the arts and literature to this day. Due to the mild and healthy climate with its temperate winters, autumn rainfall, its bright springs and sunny summers, Lesvos is a fertile and productive island in agriculture and the fishing industry continuous to thrive. The bay of Kalloni provides amongst all different types of fish, the sardines (which are a famous delicacy when salted) also shell fish. 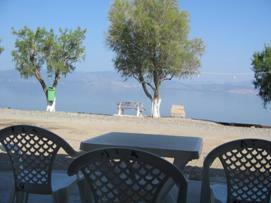 From the early eighties, tourism has become a major contributor to the Lesvos economy. But it is still virtually, unaffected by the mass tourism which inevitably has turned other islands and resorts into westernised amusement parks. In resent years Lesvos has become known for it "green credentials" and green tourism.This is especially noticeable in the South of the island which is blessed with award winning sand and pebble beaches of every size and description; some are busy with activity and water sports others are quiet, or even deserted. 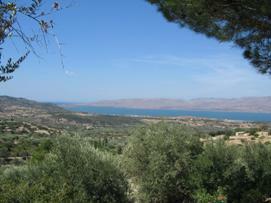 The south east of the island is clad with olive groves, pine forest and sweet chestnut woodland. Thus these areas are home to a surprisingly large variety of wild flowers / orchids and a magnet for migrating birds as well as an exciting variety of breeding species. Visiting the island does not demand a bottomless pocket! You can have a great time and still not spend a fortune. Some locations, like Vatera are more inexpensive that others. You can save money by going there and have just as much fun or more than you will do, if you go anywhere else. If you love the Greek islands for their "Greek ness", the diversity and variety they can offer, LESVOS can do that much better, at a much bigger scale from that of most other islands you have visited. Sappho (circa 630 B.C.) was one of the great Greek lyrists and few know n female poets of the ancient world. She was an aristocrat who married a prosperous merchant and had a daughter named Cleis. 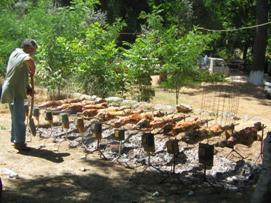 She was wealthy enough to live the life she chose and study the arts at the island of Lesvos. In the 7th Century B.C. 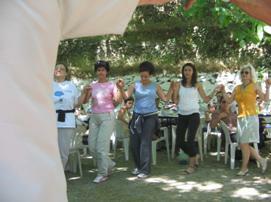 Lesvos was a cultural centre. Although Sappho spend most of her time on the island, she also travelled widely throughout Greece. Because of her political activities she was once exiled to Sicily. The residents of Syracuse were so honoured by her visit; they erected a statute to her. Sappho was called a lyrist because she wrote her poems to be performed with the accompaniment of a lyre. She composed her own music and refined the prevailing lyric meter to a point that it is now called the Sapphic meter. Her style was sensual and melodic; mostly songs of love, yearning and reflection. She was very much honoured in ancient times. While she still lived coins of Lesvos were minted with her image. Plato elevated her from the status of great lyric poet to the status of the tenth muse. Upon hearing one of her songs, Solon, an Athenian ruler, lawyer and a poet, asked that he be taught the song �Because I want to learn it and die�. Unfortunately only one of Sappho�s poems is available in its entirety � all of the rest exist as fragments of her original work. From ancient times to today, Sappho has remained an important literary and cultural figure. Her works continued to be studied and translated. She inspires new poets constantly and speculation on her life remains popular in the form of fictionalised tales and ardent research. For a woman who has been dead for over two thousand years, this is quite an achievement.